Maybe she’s your confidante and your conscience gauge; perhaps she’s both mentor and tormentor; your biggest critic and most loyal fan. What about money lender, chauffeur, adviser, babysitter, and a thousand ever-changing roles throughout your life? This year, Mothering Sunday (or Mother’s Day) falls on 26th March. (We know how important a date it is, which is why we’ve dedicated a whole selection of Mother’s Day Presents to the occasion!) But what’s the best way to show her your gratitude? Since Mother’s Day comes round only once a year, we wondered if a cup of tea in bed, a £1.50 card and a vague promise to behave really cuts the mustard these days. In Red Letter Days’ capacity as gifting experts and special occasion enthusiasts, it fell to us to answer the question: what do mothers really want? We set about our research by speaking to mums and children about their thoughts. Thanks to a survey, polls and lengthy chats on Twitter, we garnered all sorts of surprising and touching information about the types of gifts we give or hope for, the important women in our lives and the traditions we uphold… And thanks to this data we believe we’ve unlocked the secret to getting Mother’s Day just right. Does homemade trump shop-bought? Are experiences better than tangible gifts? Take a look at what we found. 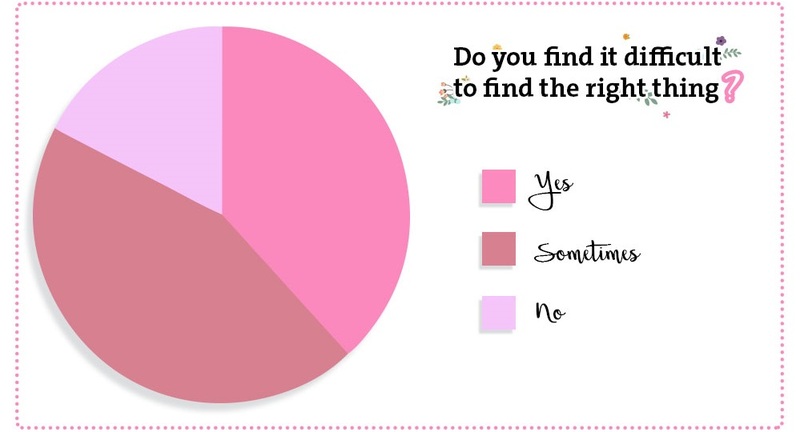 83% of those buying for mums find it difficult to decide on a gift. If you find the task of buying a Mother’s Day gift daunting, you’re not alone. The majority of people we spoke to said they find it difficult to discern the perfect present or gesture. A much smaller percentage told us they don’t have that trouble. Lucky for some. So how can we put this right? How can we ensure we do something that will be truly appreciated on this special day? And why is it so difficult to get it right? Mums prefer to DO things rather than GET things. We hosted a Twitter party to discuss just this topic. We also put out a survey asking for candid thoughts on what makes the best gift (to give or to receive). 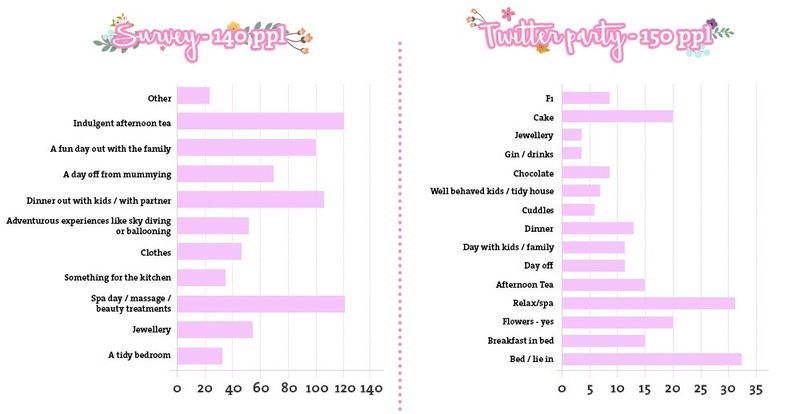 The results of the party and the survey were very similar. We discovered – quelle surprise! – that mums far prefer experiences over tangible gifts. Of course, to the Red Letter Days team (long-time believers in the superiority of the experience gift) this comes as no shock. Like us, mums have great taste. Spa days, going out for afternoon tea or for dinner and simply a morning’s lie-in were the most popular wishes, our research found. For the average mum, an ideal day involves doing something fun and relaxing, often with their family. Breakfast in bed was surprisingly low on the agenda, as was having the children tidy their bedrooms. Mums don’t expect us to spend as much as we do. We asked mums and buyers how much they thought should be spent on a Mother’s Day gift. The results were a surprise. The majority of buyers believe that a £51 – £100 price range is optimal. However, hardly any mothers agree with this bracket. Mums varied in their opinions, but most told us that the £31 – £50 range is most suitable. The ‘other’ column refers to mothers who prefer to receive a gesture or a homemade gift rather than have money spent on them. This was a common theme throughout our research: respondents agreed that something homemade really shows effort and thought. 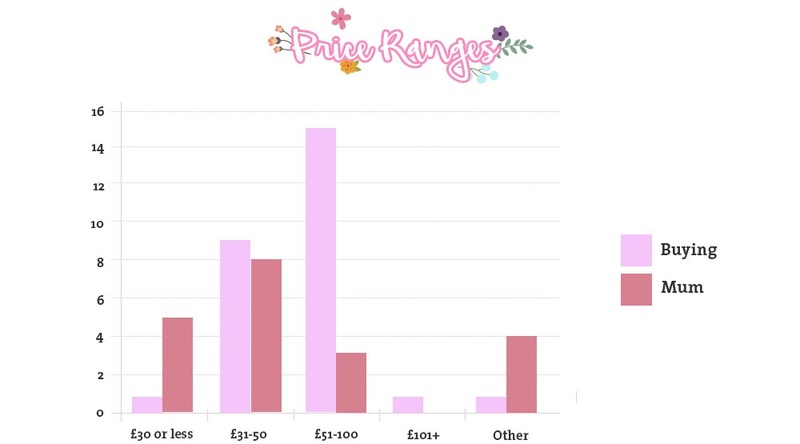 The disparity between what price the mothers and the buyers think is appropriate might be down to the fact that our mums don’t communicate to us what they’d like. Take out the guesswork and ask your mum straight up what her heart desires, or send your dad on a covert mission to find out. If you’re a mum, don’t feel bad about dropping some helpful hints! Children recognise Mother’s Day from a young age. We found that kids tend to learn about Mother’s Day at around 5 years old, thanks to school or nursery activity. Lots of the mothers we spoke to received something homemade and special when their children reached this age. Dads are a big help too. We learned that a lot of fathers put in the effort when their little ones are too small to buy something themselves, and we’ve even heard about dads giving cards on behalf of baby bumps! Then there are the little kids who manage to take matters into their own hands with no help from Daddy or teachers. Taking initiative: we love it! Among the weirder Mother’s Day gifts we learned about, the ones that tickled us most of all were: Spanx underwear; a snail from the garden; a dirty sock filled with daisies; dry stir-fry noodles; a banana cutter and a personalised shot glass… with somebody else’s name on it. It became clear from our research that the best kind of gift to send on Mother’s Day is an experience. In particular, relaxing activities are preferable. Think spa day with treatments, a leisurely afternoon tea or a slap-up restaurant meal for the whole family. Forget the breakfast in bed, but do put in the effort to make your own card or keepsake from scratch. A homemade extra is the perfect complement to an experience gift. One thing that’s impossible to ignore from our results is how important our other maternal figures are. We came across countless outpourings of love for grandmas, step-mothers, sisters, aunts, mothers-in-law, neighbours and family friends. Clearly, Mother’s Day isn’t just for celebrating biological mums. There isn’t a popular UK national day to honor these people, but we know the extent of the impact they have. From all of us at Red Letter Days, we wish a Happy Mother’s Day to all the maternal figures, role models and all-round fabulous women in our lives. Don’t forget to thank yours (and treat them!) too. If you’re stuck for something to show your appreciation to your mum or other favourite woman this year, take a look at our Mother’s Day Gift Guide. You’ll find everything from the personal to the unusual. There are book club subscriptions for the lit-lovers, special massages for expectant mothers and climbing tours of the roof of London’s O2, to name a few. Have a browse and get inspired. To mums everywhere: Red Letter Days wishes you a perfect day. Images are courtesy of Unsplash. All data is Red Letter Days’ own.